My blog "Amish stories" is having a "Witness farm tour contest". What i'm looking for is readers to write their own sequel to the movie "Witness". I'm not looking for the entire movie script, just about 300 words or less so it would be a concept for another movie. The winner will win 2 tickets to tour the actual farm where the movie was filmed, plus the winner will tour Lancaster county and will see most of the locations that was used in the movie . The farm where the movie "Witness" was filmed is now owned by an Amish Family, so the family is giving permission for maybe the last time for this tour. The winner will also receive a small gift which will be provided in the tour. 1st prize winners will also receive 2 tickets for Jacob's Choice. 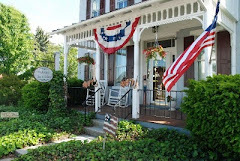 There will also be a 2nd prize for 2 tickets for the Amish Homestead. This contest starts today(Monday) with a deadline set for saturday. The contest is sponsored by The Amish Experience in Bird in hand, pennsylvania. Please go to www.Amishstorys.com to enter this contest. Richard from Lebanon county's Amish community.